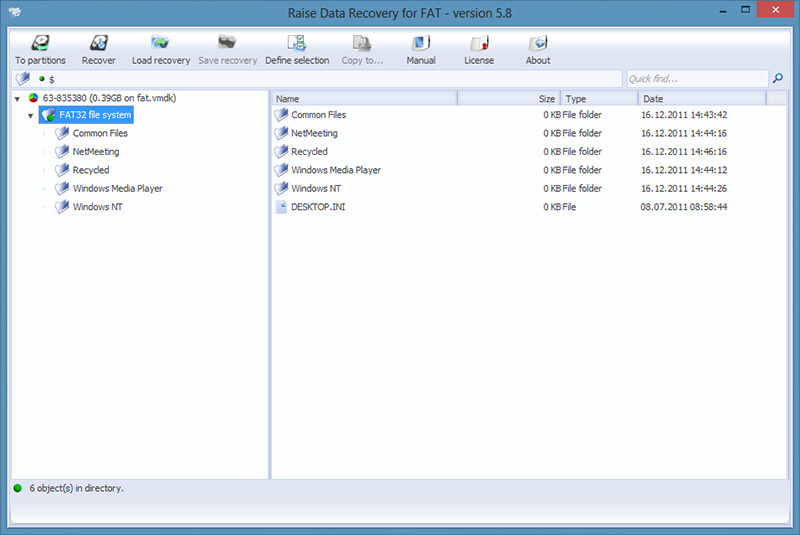 Raise Data Recovery for FAT is a software application specialized for FAT file system of Windows OS. The software allows to find and recover accidentally deleted corrupted and lost files from FAT file system of Windows OS. 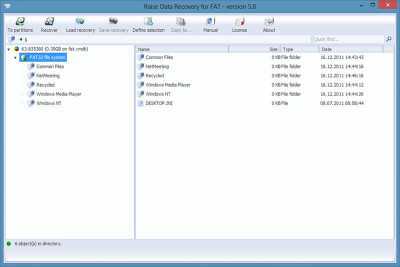 With Raise Data Recovery for FAT you can get your data back from a memory card of your digital photo or video camera or from any portable device formatted with FAT file system. This program enables reconstruction of a damaged FAT file system even in severe cases. Supporting various other file systems Windows (NTFS) Apple Mac OS (HFS+) Linux (Ext2 Ext3 Ext4 Reiser XFS JFS (JFS2) and FreeBSD (UFSUFS2) Raise Data Recovery for FAT allows to detect your file system type and select Raise Data Recovery product for your file system.FAT file system features quite good chances for recovery of deleted files unless theyre overwritten. Powerful tools used by Raise Data recovery for FAT increase chances to recover lost data with maximum possible data recovery result. 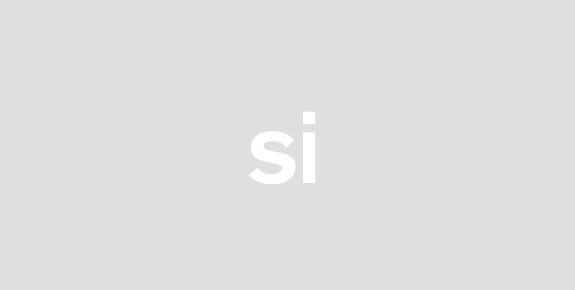 Requiring no prior professional skills Raise Data Recovery for FAT best suits home data recovery from a vast variety of portable devices and memory cards based on FAT of Windows operating system. Working in a read-only mode this program ensures complete safety of your information originally contained in the storage.